We’re hijacking the spotlight yet again with a Dallas-created version of chicken fajitas that were so good, I ate them three days in a row. I don’t even like chicken, so when he proposed making chicken fajitas last week, I thought, meh. And, boring. 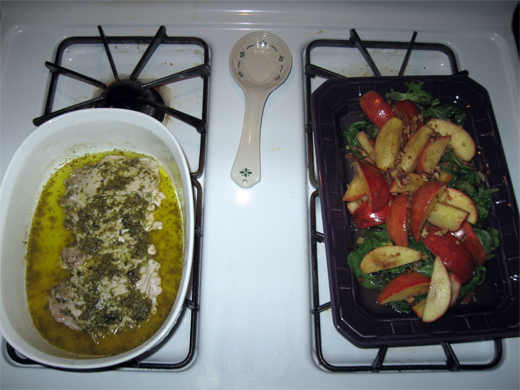 Chicken, peppers, onions, yawn. But trust me, people, this dish was anything but “yawn”. The seasoning and cooking methods he employed made all the difference in flavor, and the addition of a few special ingredients turned this dish into one of my favorite Dallas-made STM’s ever (followed closely by Mexi-salad with fresh guac). 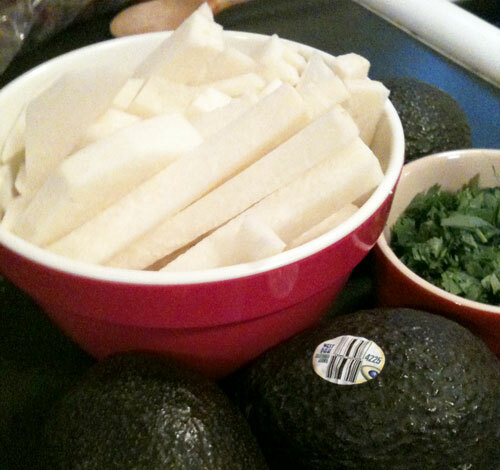 Jicama, avocado and cilantro - a fresh and flavorful combination. There's no reason all of your meals can't look this good. The mexi-salad was one of the first paleo recipes we tried and is still a favourite in our house – I think it’s the awesome guacamole that makes it! I might be able to get jicama from the markets, but could you use something as a substitute? I’ve been “flirting” with Paleo for awhile now…cleaned up my diet a bunch (though I can’t totally claim to be Paleo)- but frequent and refer people to your site for good recipes. Your mexi salad recipe (though I omit the cinnamon) is one of my favorites!! And that quac…I make it often and put it on everything!! I really enjoy reading your posts and this is yet another recipe that I can’t wait to try! Hey guys! Made this meal last night for dinner with the family and girlfriend. It was a huge hit and amazingly tasty! We demolished almost all of it, with just enough for lunch today. It looked awesome as well when we dished it up on a huge platter to eat together. Excellent STM, keep them coming! Melissa- in some of your recent posts you mention music…I am in dire need of a new playlist…I would love to hear some of your favorite workout music! Yummy. Best idea I have seen in days. The kids even ate it. And with your suggestions…made enough for tomorrow. Can hardly wait. Thanks for all you do. Any ideas on where I could find jicama? I live in Philly – we have Asian markets, Mexican bodegas, and farmers markets… I haven’t checked the Asian markets yet, but the Italian Market and Whole Foods don’t seem to have jicama. @Joanna: That’s totally weird – most “normal” grocery stores carry jicama, and I’ve always been able to find it at Whole Foods, either whole or pre-cut and packaged. You know what it looks like, right? (A flatter, round potato looking thing.) Ask the produce guy next time you hit the grocery store, I’d be surprised if they didn’t carry it now, as the peak season is late Fall to early Spring. Jicama, while incredibly delicious, is a member of the legume family. You’re completely correct on both counts. However, since we’re eating the root of the plant (and not the seed), the concerns that we have with legumes as a broad category do not apply. Same story with something like sweet pea shoots, which I’ll eat from time to time. Thanks for your comment. This was phenomenal. Thank you!